We invest in the best label printing equipment available to best serve our customers, including our new state-of-the-art flexographic label press, the Mark Andy Performance Series P5 Press. 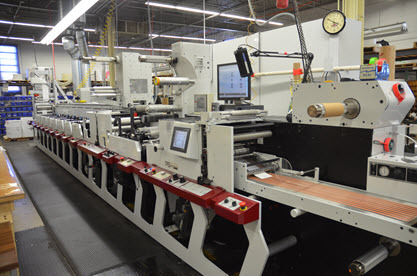 This long-run and short-run capable, high performance label printing press allows us to operate at peak productivity and efficiency while producing the highest quality labels on the market. Our Domino High Speed UV Ink System prints 246 feet/minute of stunning 600dpi x 1200dpi labels. 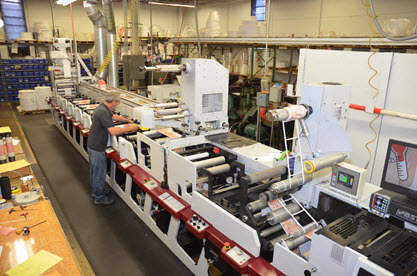 This high-speed, high-resolution machinery prints on a nearly limitless array of label materials, so our customers get the labels they want, when they want. In-house art department: Starting from scratch? Our skilled and experienced team of designers can create beautiful custom labeling for your commercial product, fast. Our pre-press department allows us to quickly and efficiently move through the label creation process. After you approve your art, we shoot it right to our industry-leading in-house plate making team to create the label print plate, then go to press in a matter of hours instead of days. Most of our custom-made plates are made with 175 line screen to ensure the finest label details pop. We also support 150 and 133 line screen. 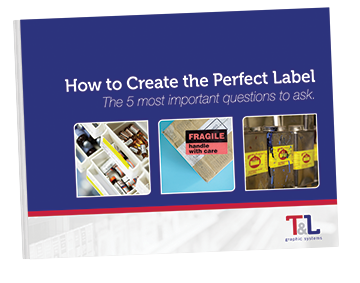 "How to Create the Perfect Label"
Download our FREE eGuide, "How to Create the Perfect Label" and discover the 5 most important questions to ask so you get the perfect label every time!